A shaved head can look great. Not to mention the coolness factor and the practical side of things: no more bad hair days or styling products. And the ladies seem to dig bald heads. Just ask Jason Statham. Sporting a bald head can make you look very sharp; forget about comb-overs, hair pieces or other stuff that will just make you look ridiculous. Whether you have a full mane and shave your head just for the looks or it’s because your hair is really starting to get thinner, once you’ve embraced your baldness you’ll need a proper tool to do the actual shaving. 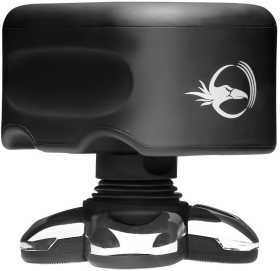 Choosing the best head shaver for your particular case is quite important since you’ll be shaving the dome quite often. It will be part of your (almost) daily routine. Most men can get away with shaving their head every two to three days, but that’s still a lot shaving. Even though there are some very capable blade shavers out there, we are going to address just the electric head shavers in this article. Some may disagree, but I consider them to be safer, more comfortable and more practical, even though a blade will get you the closest possible shave. But with some careful planning and informed decisions, a quality electric head shaver will get pretty close to that and the results will satisfy most men. Before going any further, it’s very important to understand a couple of key differences between shaving your face and shaving your head. First of all, the surface of the head is a large, spherical area; in contrast, your face has (almost) flat surfaces — your cheeks and neck. Secondly, you can’t always see what you’re doing when shaving your head and you have to reach behind your head in a pretty awkward position. 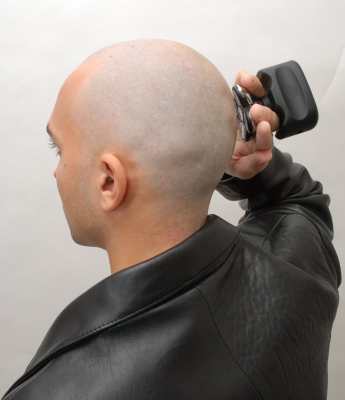 Taking into account these specific differences, the best electric head shaver will ideally be able to cover large areas and conform to the spherical shape of the head; at the same time, it will have to be designed in such a manner that holding it will allow you to easily reach behind your head. The ergonomics and ease of use are even more important for this type of shaver. Remember that the area to be shaved is pretty large and can be difficult to reach everywhere; and again, this is something that you’ll be doing pretty often. Now that we have a clear understanding of the qualities that a shaver must possess in order to be effective at shaving the head, let’s take a close look at some of the best electric shavers for bald heads. What are some of the best electric head shavers? The Skull Shaver Bald Eagle seems to tick all the right boxes. 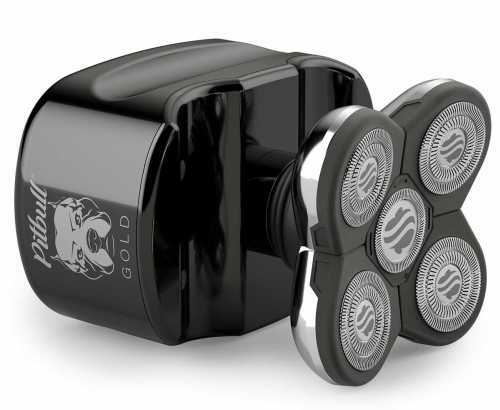 It has 5 rotary shaving heads that flex individually and adjust to the spherical surface of the head. The main advantage of this razor is the design of the handle; it allows you to hold it with the palm facing your head, making it supremely practical and easy to use. No other shaver with a conventional grip can match the Skull Shaver when it comes to shaving your head. You can use it with circular overlapping motions, covering large areas in a short time. It is easy to clean and the replacement blades are relatively inexpensive. While the Skull Shaver will get the job done, it’s not the best shaver out there to be used on your face as well. If you choose it as your head shaver, I would recommend having a dedicated shaver just for your face. Due to its ergonomic design, the Skull Shaver Bald Eagle is pretty much in a league of its own. You could however choose to go for a different one, maybe a more versatile razor that can be successfully used for your face as well. The Pitbull line of head shavers from Skull Shaver represents an improvement over the older Bald Eagle shavers. With higher quality materials, more power and redesigned blades, the Pitbull shaver is without a doubt one of the most capable head shavers you can currently buy. Platinum (90 minutes cordless operation, chrome, 1 year + 6 months warranty, travel lock, case, rinse stand, cleaning indicator). The performance is the same throughout the entire line. All Pitbull shavers can be used wet or dry, corded or cordless. Considering the price and the differences, I think the Gold variation represents the best pick for most men. Just like the original Bald Eagle head shavers, the Pitbull Gold features 5 rotary cutting heads and that trademark handle that makes shaving your head a breeze. 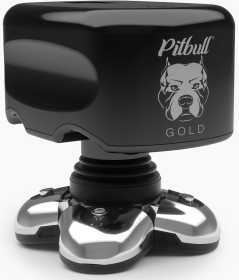 The price of the Pitbull Gold is usually higher than the base Bald Eagle Smart which still represents the best value for money in Skull Shaver’s lineup. 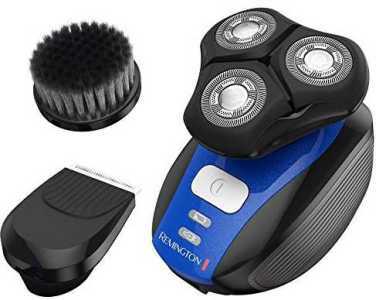 The XR1400 Verso is a very interesting and quirky electric shaver from Remington. 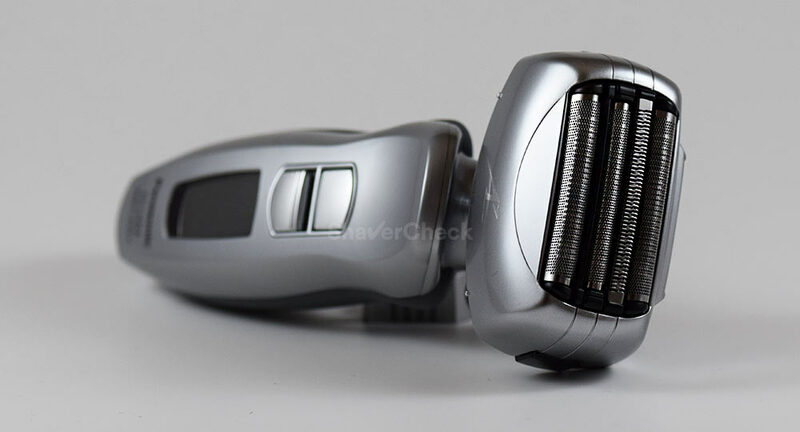 Unlike the Skull Shaver, this one is just a regular electric razor intended for your face. But because of the unconventional grip, it is an ideal machine for shaving your head. Being a triple head rotary shaver, the XR1400 Verso can cover large areas and adapt easily to the surface of the head. It’s suitable for wet/dry operation, so you can grab your favorite shaving cream for a closer and more comfortable shave. The Remington XR1400 Verso also comes with two useful attachments, a facial cleaning brush and a beard trimmer. You can swap them easily depending on your needs. This particular model blurs the line between the shavers designed specifically for your head (like the ones from Skull Shaver) and the regular electric shavers we all know. And the latter can represent a viable solution for shaving your head as well. In this case, the ergonomic factor is pretty much the same for all electric shavers when they’re being used for shaving the head. The type of the razor — foil or rotary — depends entirely on your personal preference. Both of them can be successfully used for shaving the face and head. However, I would strongly recommend going for a more capable shaver. That doesn’t necessarily mean a very expensive one, but since it’ll have to do a lot of shaving, it must have a fast motor and plenty of cutting power. Going for a shaver with more cutting elements that can move independently and can easily conform to the surface that’s being shaved would be a good starting point. In the foil camp, we have the Panasonic ES-LA63-S Arc4 that’s been getting a lot of praise for being an extremely capable electric razor for shaving the head as well. It has 4 individual blades that form a large shaving head, ideal for shaving the head. Panasonic’s 30-degree nano blades are one of the best in business and the motor powering them is a very fast 14 000 CPM (cycles per minute) unit. It can be used for both wet and dry shaving and can also come with a cleaning and charging station in the form of Panasonic ES-LA93-K (other than that and the color scheme they are identical). 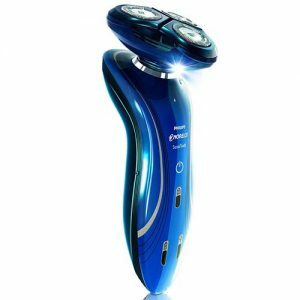 Another more budget-friendly option would be the Panasonic ES8243A Arc 4 that is still a very capable razor and will work great for the face and head. It also has 4 cutting blades and a slightly less powerful 13 000 CPM motor. 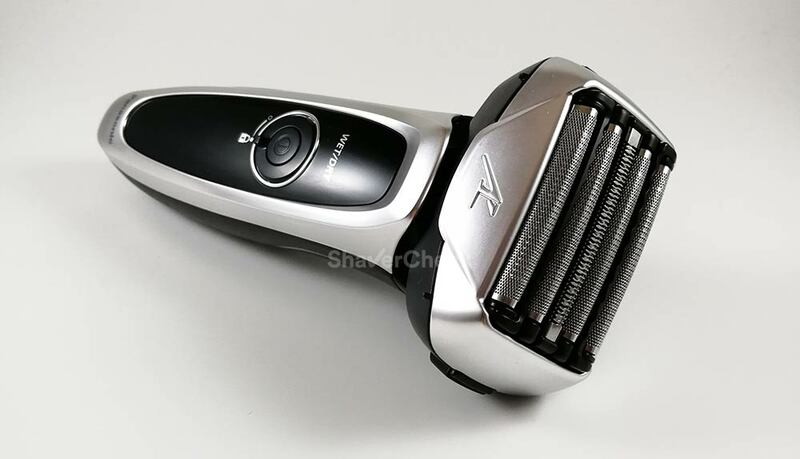 To keep the price low, the shaving head’s flexing capabilities aren’t as advanced and Panasonic also ditched the second motor of the ES-LA63-S that causes the foils to vibrate and capture flat-lying hairs. 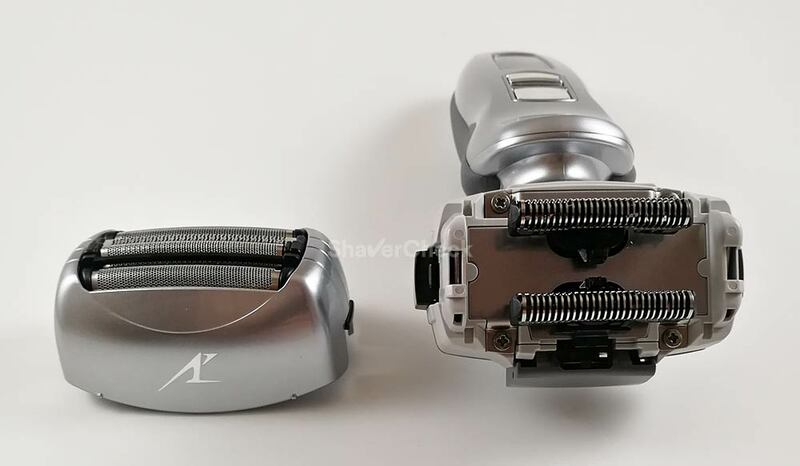 If your budget allows it, you can go for a Panasonic Arc 5 ES-LV65-S that features a massive 5 blade shaving head and it’s one of the fastest electric shavers you can currently buy. As expected, it works great for maintaining a bald head. The shaving head can flex in many directions and maintain constant contact with the surface of the head, while the sharp blades and powerful motor will ensure a fast and close shave. However, keep in mind that the Arc 5 is more expensive than an Arc 4 and for most men the 4 blades on the Arc 4 will be more than enough for the job. 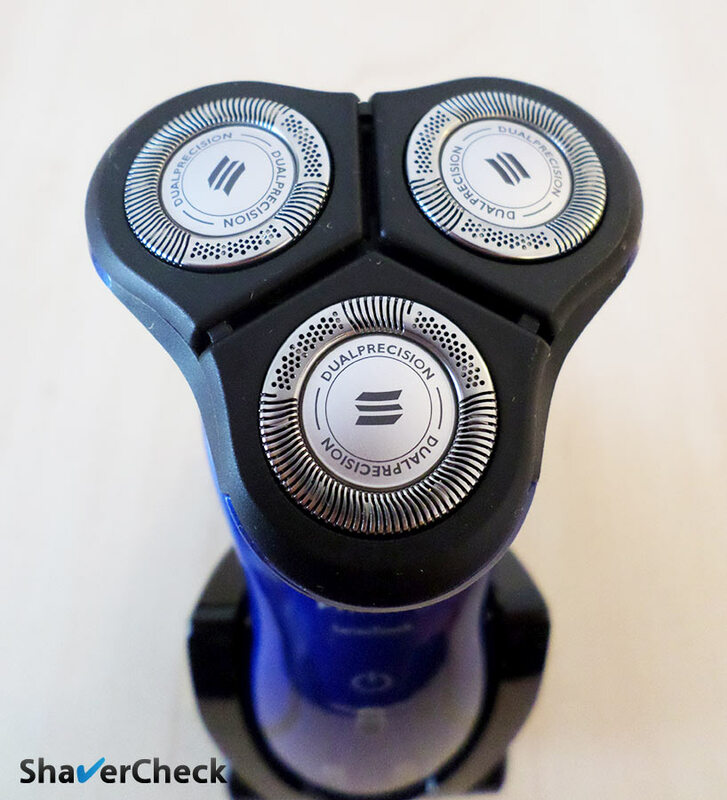 A rotary shaver has the advantage of using circular motions when shaving, thus covering larger areas in less time. 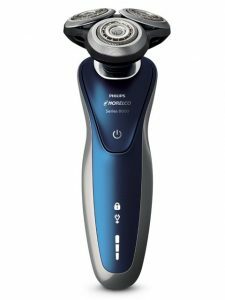 Philips Norelco 6100 is a very solid option; it is reasonably priced, has contour-following capabilities and three cutting heads that adjust to the surface that’s being shaved. You can read our full of the 6100 here. If however your budget allows it and you want one of the best rotary shavers, the Philips Norelco 8900 is the one to have. The contour-following system allows it to flex outward, pivot and tilt, while the advanced shaving heads are extremely effective at covering large areas fast. These features make the Norelco 8900 one of the best shavers for your head and your face. In fact, I would say that its performance matches the one of the much more expensive Norelco shavers from the Series 9000, like the 9300 and 9700. It is suitable for wet and dry operation and comes in two variations, with or without an automatic cleaning station. There are of course other razors out there that will also work very well for shaving the head; choosing one comes down to budget, technology used (foil or rotary) and capabilities. This article aims at helping you narrow down your options. When choosing what should be the best head shaver, make sure you’re taking into account the specific qualities of the razor outlined in this post. Some of the options are a bit expensive, but in the long run the higher price of a more capable and comfortable razor is well worth it. Just think about all the money you’ll be saving from not getting haircuts anymore. Great detailed shaver review. Thanks. I didn’t even know a skull shaver existed. I really like how the bald eagle smart operates but it just doesn’t cut close enough on my head for me. Guess I will keep looking. That’s quite unfortunate. The warranty should nevertheless cover it. Thank you for sharing your experience. I have a recent model 2018 and found that it worked really well dry shaving until I tried using it with shaving cream; went fine first few times but eventually it sounded like the motor was dying – it even stopped completely with heads removed. Cleaned the heads with vinegar and boiled water, popped it back on to recharge a bit and now works like new again. Clearly its not cut out for use with shave products (even though they say foam is fine). Same here. Not cleaning may cause jams and not working. Mine is clean but it has been inconsistently annoying. In the middle of shaving, it stalled many times. A $90 waste. Will NOT recommend. I too had the skull shaver and like the 1000’s of reviews online, it stopped working and the customer service was rude to me. I am sorry to say that this type of experience still goes on today. Hi Mike, thank you for your comment. Can you provide more details on your problem and what exactly was the position of the customer service regarding your request? I will update the post and try to provide a better alternative if this is still the case today with the Skull Shaver. I have had terrible experiences with the Skull Shaver dying as well. I purchased it in June 2016 and have been through four of them (just filled out a replacement form an hour ago for the fourth). They are that good, otherwise I wouldn’t deal with the hassle. This review will be updated pending the newest replacement I just did. I would say be professional, provide them information, save it for the next time, and give it a try. Just make sure you order from one of their licensed retailers. It is a great shaver and I regularly get comments asking how often I shave my head and most can’t believe it is with an electric. Thank you for taking the time to share your experience. Good to hear that at least their customer support has improved. I purchased as trinity 1 great for your face it’s not made for the head just don’t get down to that smooth nails feeling.very disappointed. Used the eagle for more than a year, until battery or motor die (not sure) head blades are fragile, shaving good but no so close. Never worked on my face. Now using a Headblade ATX and mach3 with Kiss my face, amazing shave but time consuming and expensive. Want to return to electric and the Panasonic Arc5 is what I want. Thanks for the reviews. Thank you for your comment, Jorge. Hope you’ll have a better experience with the Arc 5. Your site was super helpful in choosing an electric shaver! 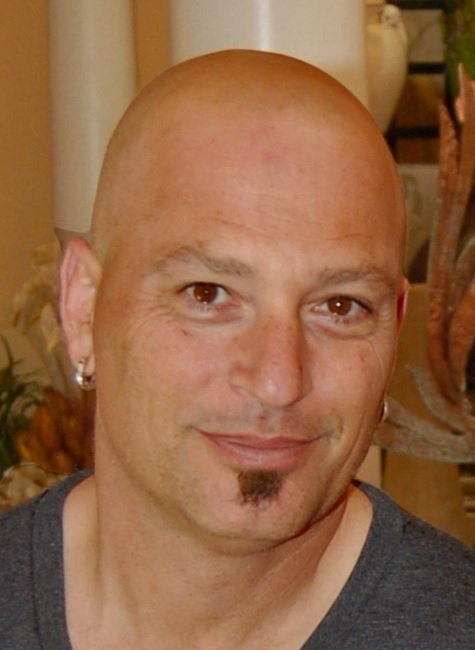 From your avatar, it looks like you might not have personal experience shaving your head. For me, it’s really not an issue of grip or angles, and I bet the same is true for most guys. Just like with my beard, I use straight lines, but instead of using the mirror I go by feel. I read your other reviews and ended up buying the Arc 5. Just finished my first use. My head is cleaner/smoother than I even get at the barber. The shaver has a timer, so I know it took about 7 minutes to go from 4 days growth to silky. Highly recommend. Thank you for your comment. You are right, I do not shave my head, but I did cut my hair by myself with a regular trimmer. I don’t do it anymore, but it was a real struggle for me to reach behind my head and do a decent job. Glad to hear the Arc 5 is working great for you. The Bald Eagle had some reliability problems and most of the negative comments are related to that model. The Pitbull should be better in this regard. I bought the Pitbull Gold and would NOT recommend this POS to anyone. The battery in mine doesn’t have enough power at 88% to keep working. I then have to plug it back in to charge to 100% and clean it – sometimes need to take small tweesers to clean out hair. That clearly looks like a defective unit. In my opinion you should contact the seller/manufacturer and ask for a replacement or refund. The skullshaver.com company is dysfunctional. Satisfaction is NOT Guaranteed as promised. Too many cheap plastic parts are used and the design is flawed. My Pitbull Platinum Shaver broke within warranty. And the shaving heads were NOT replaced/ refunded after I returned them. Skullshaver.com has a very bad return policy. To many loopholes that allows skullshaver.com to circumvent a real warranty and/ or Guarantee. For example, if you took the heads apart, which is too easy, then the warranty is voided. If there are hairs over .25 inches found in head, then warranty is voided. Staff only looks for excuses to avoid warranty and/ or Guarantee. They blame/ shame the customer.